I'm back from my studies in France with Ovanes Berberian. It was a once in a lifetime experience to be studying with such an amazing artist and with such a small group- just 3 other students and me. I took in so much information from what he shared, what I learned from my fellow classmates, Tania Pagliato, Bruce Bingham and Keene Wilson, and observing Ovanes' demonstrations. Now the hard part, having the discipline to focus on digesting all that and integrating it into my own work where it feels right. It can be very frustrating to think you understand something but not yet have the ability to execute that understanding on the canvas. But it's part of the process and learning to paint is not a linear, neat or speedy process. The point of learning from another artist is not to emulate him or her but to see what approaches they use that may be new to you that might enhance or expand your own expression. Of course that is much easier said than done. Sometimes it really feels like trial and error. My approach is to pick one or 2 things and focus on them (for me, I'm starting with being more cognizant of mixing colors and changing color temperatures). I've also picked up some other technical "habits" which I'm integrating such as how I lay out my palette, including a silver grey on my palette (white and mars black) and mixing linseed oil into my paints for more fluidity. This paintings was my first plein air attempt since I've come back. I was at Loganberry Farms in North Georgia yesterday with a group of other artists. I was tempted to do a bigger landscape scene, but restrained myself to do a close up of smaller subject since I thought it would be a better opportunity to apply what I had learned and build on the other still life paintings I worked on during the workshop. Here are some other photo's from Loganberry Farm. More to come on my learnings. Back from 2 weeks studying in France with Master Russian Artist Ovanes Berberian, known for his brilliant color and impressionistic paintings. Still unpacking and sorting out after the trip. Haven't worked further on any of my oils, but wanted to at least share something from the trip. Below was a still life set up I had arranged outdoors the first day. Above is a quick watercolor study of it. I am working on an oil version. Just did the initial stages while in France but will share it when complete. We had rain practically every day, which wasn't that pleasant for painting outdoors, but we had a tent. Despite the bad weather it was an amazing experience to have access to such an experienced, accomplished and passionate painter. There were only 4 students so we got a lot of attention. One day we went to the Museum of Fine Arts in Lyon with Ovanes and he shared his thoughts about some of the paintings we saw. A rare treat indeed. 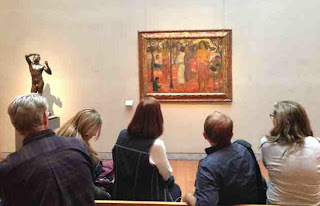 I'm here (3rd from left, with Ovanes 4th from left) looking at one of his favorite paintings by Gauguin. Photo complements of one of my new art friends and fellow student Bruce Bingham. I have been in France studying with master colorist Ovanes Berberian for the past week. 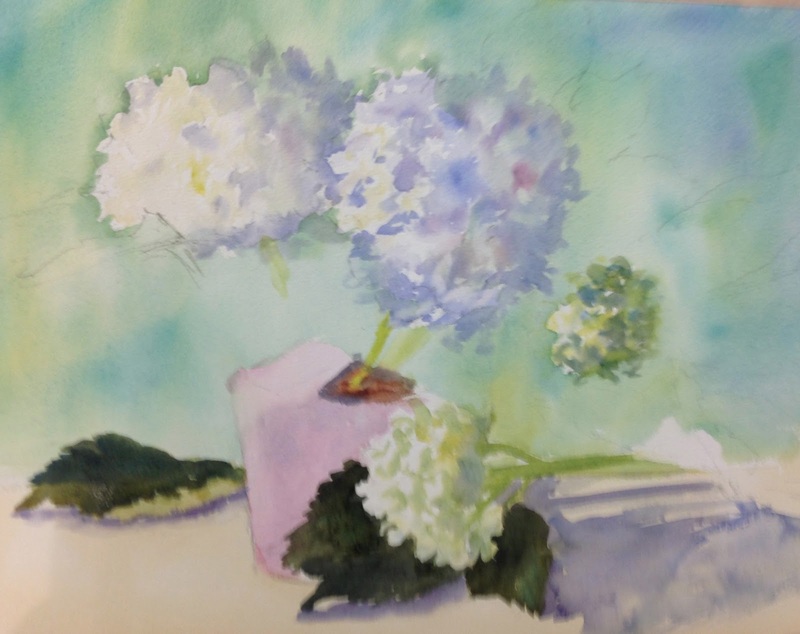 Have several oil paintings in various stages of development, not ready to share yet, but this is a watercolor sketch of one of the oils I am working on. The weather has been bad rainy and cold. We are painting outside in natural light, so it is not too comfortable but the upside is this time of year there are glorious flowers all around. 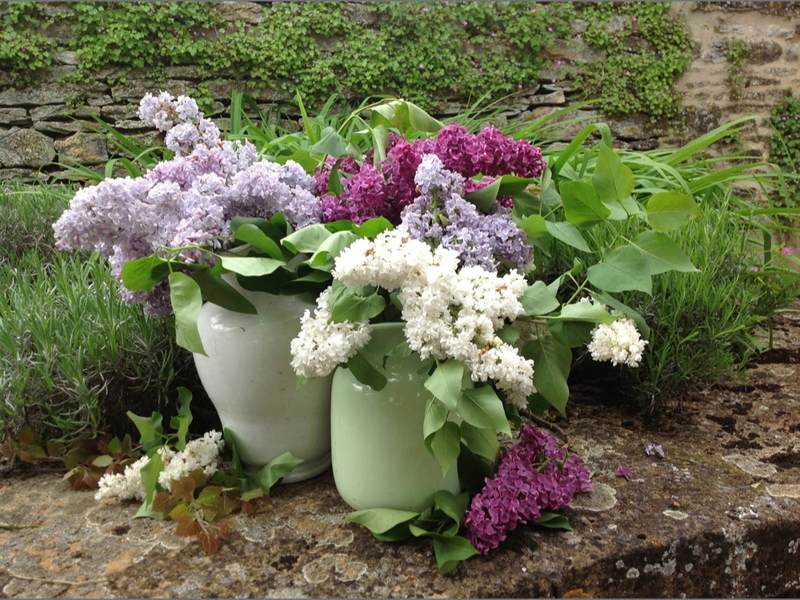 These are lilacs from a nearby garden. 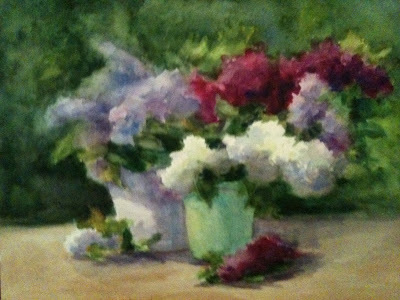 We also have wisteria, irises and peonies ( all beautiful and challenging to paint). More to come soon. This is a demo painting I did at the workshop I recently taught at The Bascom in Highlands North Carolina. 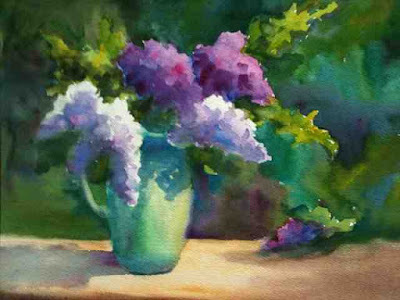 The workshop was specifically on "Capturing the Essence of Flowers in Watercolor". 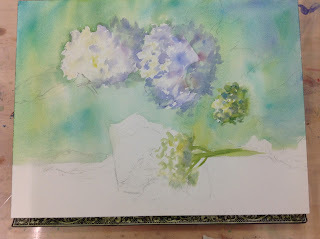 One lesson specifically addressed how to paint white flowers since in watercolor we don't typically use any white paint. Here was the set up of white hydrangeas lit from the left. 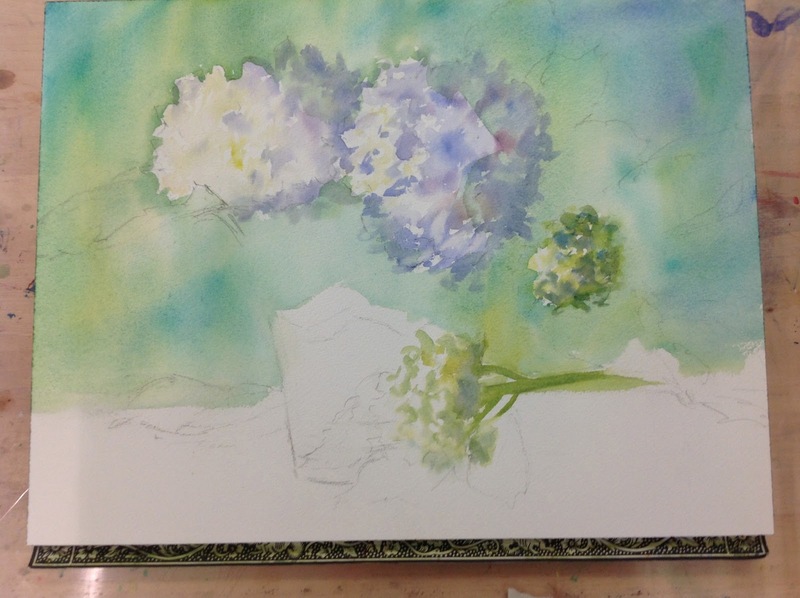 This was the initial layer, underpainting to establish form on the white flowers. I used blues, lavenders to establish the cool shadow side and warm yellow greens to tint the lit side. I tend to exaggerate the color rather than go with grays. At this point the color and value seem pretty strong, but remember we're comparing everything relative to lost of white paper. I next added a background so you could better see the shape of the hydrangeas. It's hard to know where the edge of the white flowers are when the background is also white. On a painting of a colored flowers, I might do the entire painting of the flowers and then come in with the background at the end, but here I wanted to eliminate any unnecessary white paper to better judge the white flowers. The flowers might look dark, however once I started adding the dark leaves, the value of the the flowers looked more accurate. The painting as it stood at the end of the demo is pictured as the first photo on this blog. I may make some further adjustments to refine the leaves. But will revisit in a few days to re-look and decide if it's done or if some adjustments may improve it. It's always a judgment call to avoid going too far and overworking your initial impression. Here are a few of the students having fun painting their lovely flowers. Here's another interpretation of a beautiful bridal bouquet. For more information on having a bridal bouquet painted for yourself or as a unique gift for someone special see this link. 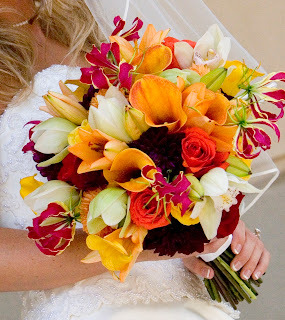 Here's my interpretation of the colorful and dramatic bridal bouquet pictured below. I used some artistic license and altered a few things but tried to remain true to the essence of the bouquet. 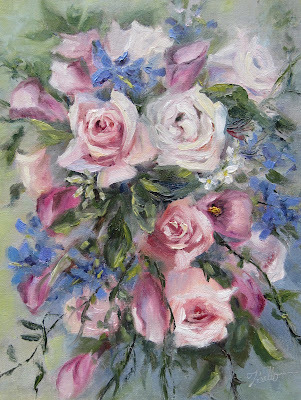 To learn more about having a bouquet painted for yourself or as a unique gift for someone special see Forever Bouquet Paintings. This painting was inspired by a beautiful little plant I bought last weekend at Boxwoods, one of my favorite shops in Atlanta. I couldn't resist the purple flowers and they looked especially charming in the yellow/green container. They said this plant was a campanula, but when I looked on line I couldn't find a flower with that name that looked like this, so if you know what this is, please let me know. 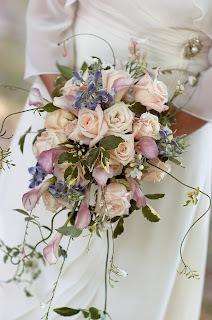 The flowers look like little tiny lavender roses-round, not bell shaped. Tonight is the opening of my show and a special evening is planned - "A Night of Classics, Art & Music. 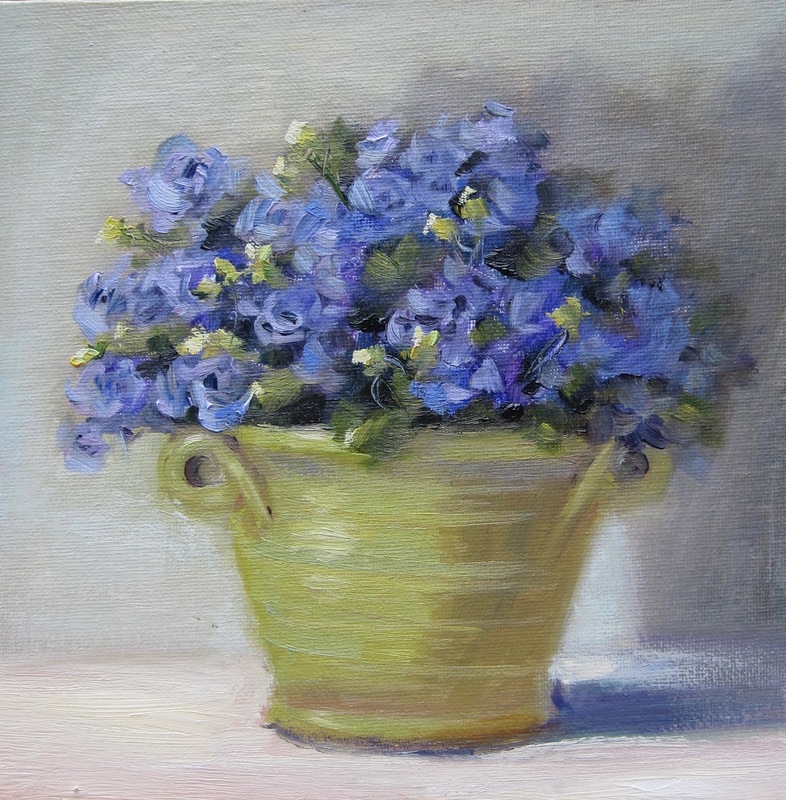 Twenty of my oil paintings are featured in a show called "A Celebration of Flowers" in Atlanta. Details are below. The event is free and open to the public. Hope you can join us. 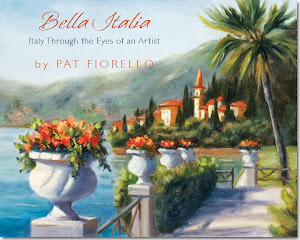 The art show will run from May 3 - June 23, 2013. Painted this watercolor as a gift for my stepdaughter and new son-in-law. They were married at The Marianna in Atlanta a couple of weeks ago and I thought a painting for their home would be a nice way to commemorate their special day and keep the memories present every day. The Marianna is a beautiful building built in 1900. Lots of charm and classic design features. It has been restored relatively recently and is very nice, intimate space for special events.